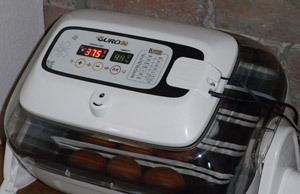 Candling Eggs is an easy process that gives you assurance that your eggs are fertile and developing correctly after a short period of time in the incubator. It allows you to remove infertile eggs and soon you will start to be able to identify ‘bad eggs’ and remove these as well. The candling photos on this page should help you to identify these. Although it has never happened to me, bad eggs can sometimes explode or ooze in the incubator causing bacteria to contaminate the other good eggs, causing them, in turn to go bad. 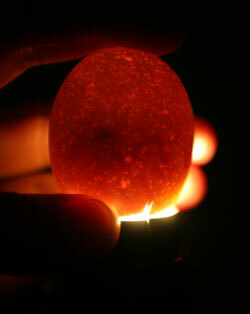 I usually candle my eggs after a week of incubation. It can of course be done before this but the first week of incubation is the most critical in terms of getting the correct development of the embryo so leaving the eggs alone during this time is good practice. After a week, we are a third of the way through incubation and it is far easier to identify fertile eggs, even if eggs have a dark shell as is the case with Marans. 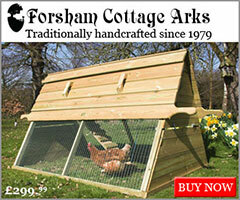 You will need a bright light and a way of shining this through the egg. 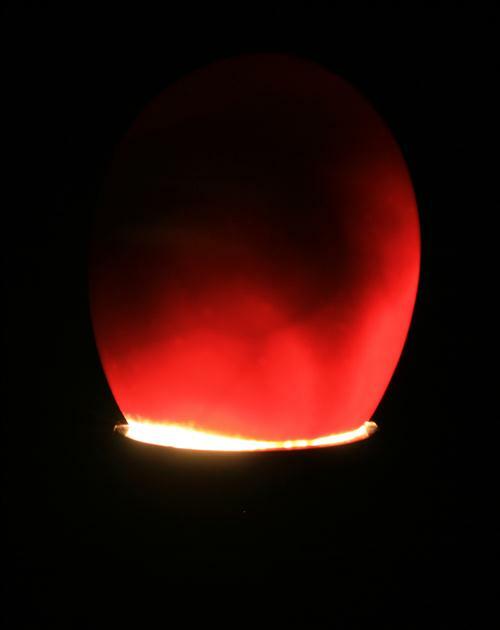 Candlers can be bought online from poultry shops, or you can make one using a bright light and a cardboard box with a hole cut out for the egg to sit on. Try to get the best seal around the hole and candle in a dark room to see the best results. If the shells are dark or have pigments / marks on them, it can be difficult seeing the embryo. I rock the egg from side to side very gently so the contents move. This must be gentle, or you risk damaging the Chalazae that hold the yolk / developing embryo. Remember not to candle for too long if it is heating the egg. I spend around 8 seconds per egg before trying the next one. Candling an Egg at Day 7, the embryo is clearly seen in the dark. After 7 days, you should be able to see development of the embryo, including spider like veins and even (if you are lucky) a little movement. The embryo often sits on one side of the egg so be sure to rotate the egg around slowly to get the best view. Occasionally, you may see a tiny heart beating if it is close to the edge of the shell. 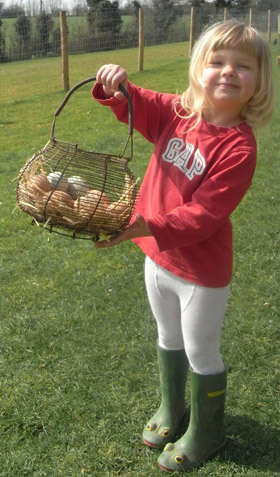 Look for fertile and non fertile eggs. Clears as they are called are easy to remove after 7 days. 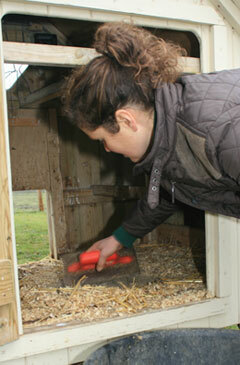 If you have a number of eggs in the incubator, it soon becomes clear which eggs have developed correctly. By day 7, you should clearly see the embryo. Don’t forget to turn the lights out in the room when you do this so you get a clearer picture! After 14 days, the embryo is well developed and turning into a chick. Two thirds of the egg is now covered and it is hard to see any detail. Look for embryos that have developed so far but died. This can be for a number of reasons, including incubation technique, damage to the chalazae (which can happen when eggs are dropped / damaged in the postal system for example) or become infected with bacteria. A red ring is sometimes seen inside the egg which is the bacterial infection. The photo to the right shows how much of the egg is now filled with the embryo / soon to be chick. It is more common to see movement inside the shell. A bad egg at day 14. The embryo has died. 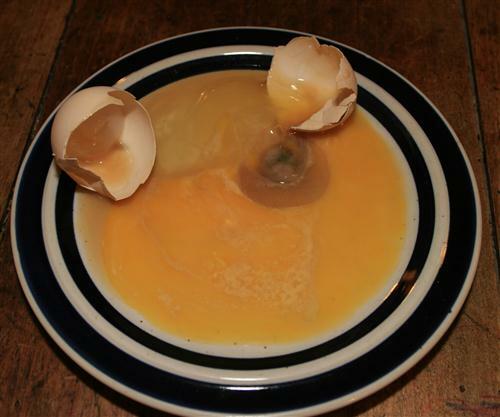 If an egg appears bad, it can be removed to prevent it from exploding and contaminating other eggs. Bad eggs can look different every time but if you compare them to the bulk of the other good eggs in the incubator, it won’t be long before you can recognise a bad egg from the rest. The bad egg shown to the right was found at day 14, two weeks into incubation. Clearly comparing this to our last photo, there is a problem. The contents of the bad egg. Bad eggs don’t change – so if you are unsure, mark it and have another look a few days later to see if it still looks the same. The second photo shows to the right shows the contents of this bad egg after it was opened on a plate. I wouldn’t normally do this because it can be smelly but was worth while to show what the contents looked like, clearly not a nearly developed chick! 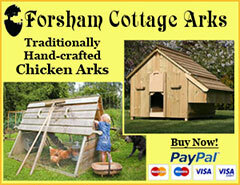 There are a few more photos on poultrykeeper’s candling chicken eggs page here. They can move a little as the chick struggles to break through the shell. They do rest in-between. 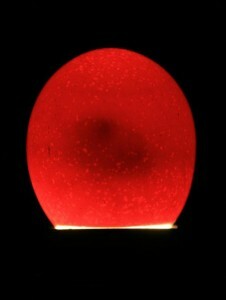 I candled the egg before incubation using a mercury vapour lamp. I could see nothing in it. Do i need to change the light source. Will there be any air sac development before incubation? Is there any way to identify the fertile egg before incubation. 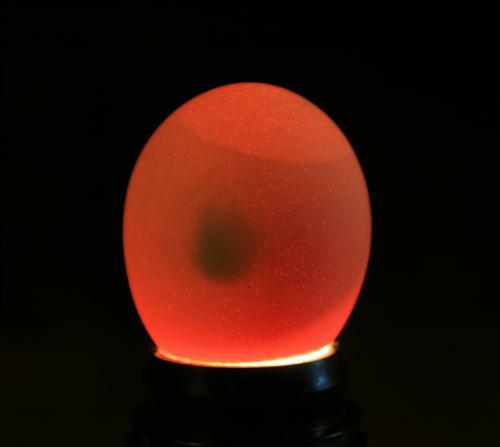 You can’t see much before incubation – but if the light is bright enough and you do it in a dark room, you should be able to make out the air sack and the yolk inside. Patience is the only way other than candling I’m afraid. Hello this is my first time dealing with broody hens and I decided to let nature do its thing but I had issues come up. I had two girls go brood about 4 to 6 days apart. About two weeks in the second hen gave up so I moved her eggs under the other hen. Well Saturday my first chick hatched and by Monday the hen left the other eggs. I put the eggs under a heat lamp with water for humidity. It has now been 3 days and all I can see is the air sack and there is no bad smell. Is there anything else to look for to know if the eggs are still alive. It’s unlikely they will hatch under a heat lamp – they need to be kept at 37.5 degrees in the center of the egg and the humidity needs to be high in order for the shells to soften before the chicks pip. A slight shadow is usually the yolk – if the light is bright enough, you should see blood vessels and a darker ‘dot’ where the embryo is. I’m into day 15 now. But I’m not sure if the embryo is supposed to be moving around by itself or not. Are they supposed to move by now? 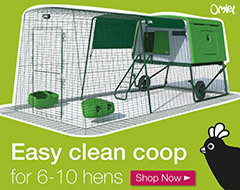 Unfortunately they don’t go broody when you want them to! Not all breeds will go broody either. The temperature fluctuates a little on all incubators. There is always an error in the measurement and there will be some over / undershoot as the heat is applied and taken off. It’s hard to avoid. It takes quite a while for eggs to change temperature and the temperature of the air inside will vary in different places. 0.5 deg F isn’t much (I make that 37.5 – 37.7C) which is about what I see on my incubator, maybe a little more so I think you’ll be fine. Just getting back online. Update is we hatched 24 of the 36 eggs. Thank you for the information and this great website! That sounds like a great result! Well done. If an egg has been in the refrigerator for about 3 days can it still hatch if put in heat ? It depends on the temperature I guess. I would think if it’s above freezing there is a good chance it would. Hi, I’m wanting to have eggs I have a few questions, can you still eat eggs if they aren’t fertile – or would you have to take the rooster away inable to eat eggs? If you want eggs to eat, you can have them whether there is a rooster or not. You will not be able to tell the difference. In the UK the limitation is that we are not allowed to sell eggs if they are fertile so mustn’t have a rooster running with hens that are providing eggs to sell.